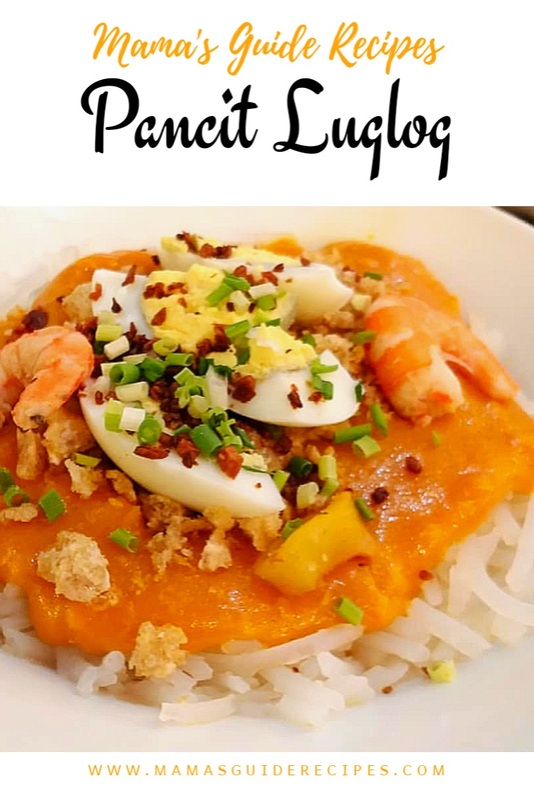 Pancit Luglog uses thick rice noodles, while all know that Pancit Palabok uses thin rice noodles. But do you know the difference between Pancit Malabon and Pancit Luglog? These noodle dishes have thick rice noodles and have the same shrimp sauce topped with a variety of savory ingredients. So what’s make it distinct to one another? Aside from their places of origin (the first one obviously originated from Malabon while the latter from Pampanga. The term “luglog” refers to the method of cooking the noodles. Luglog means to shake as you drain the water away from the noodles. The main difference lies in the sauce. Pancit Malabon’s sauce is already mixed with the noodles during cooking and they do not put too much sauce. While, Pancit Luglog’s sauce is just poured on top of the noodles and it is more saucy compared to Pancit Malabon. In a saucepan, quickly cook the shrimp in 2 cups of boiling water with a little salt. Take shrimps out as soon as they turn pink. Do not overcook. Peel and devein shrimps, you may leave some shrimps with head and tails for toppings and decorative purpose. Keep the shrimp inside the chiller for toppings later. Make use of the remaining heads and for a tastier broth and let simmer for another 10 minutes. Turn off heat. Let the broth cool down with the shells. Strain the heads and shells and squeeze out the juice from them using mortar and pestle (dikdikan) or you can also use a blender and just strains it after. Mix it back to the shrimp stock and discard the heads and shells. Reserve the shrimp stock and set aside. In a medium pot, sauté garlic in the annatto oil for 1 minute, add the flour mixing continuously until it gets lumpy for about a minute. Pour in the the shrimp and chicken stocks and mix it continuously. Bring it to a boil and adjust heat to simmer for about 5 minutes. Adjust taste and season with patis and pepper. In a large pot of boiling water, add noodles and let it cook for 2 to 3 minutes. Drain from water and transfer into serving plate or bilao. Spread the cooked noodles in a prepared lined bilao and pour the sauce over it. Assemble the toppings, add the chopped pork, squids, toasted garlic, sprinkle with finely crush chicharon, shrimps and sliced boiled egg around the platter. Garnish with spring onions on top and add lots of calamansi slices on the side or for a more authentic take, add slices of Kamias or Bilimbi fruit. Share and enjoy your party size Pancit Luglog!